I'm a little late this week, due to some connectivity problems, among other things - I hope to be back on an end-of-the-week/weekend schedule in another couple of days. Meanwhile, here's the only item in my collection that fits this particular description: It's a one-sided acetate on the Noval Records label. There's no artist named, but that's not unusual, as Noval never named the artists on their records. They did bother to credit the arranger, and as always just put his first name, in this case "Jay". As far as the material, well, this is not a demo version of a Noval record. It sounds like a demo, but so did all of their releases, and this one is no exception. To me, the structure of the song most closely resembles that of "The 23rd Channel", with a bridge section in particular sounding like a rewrite of the bridge of that record. The stunning thing about this record is that the "sweetest dream" of the title is, if I'm understanding them correctly, that the singer has now learned that she is to die soon, and will be seeing God soon. If you think I have that wrong, please chime in. When is Bob Storm NOT Bob Storm? Or maybe the better question is, who was/is Bob Storm? One of the most confounding things - among many - about the Halmark label is its artist credits. Much of the time this was handled simply - the artist wasn't credited. But when they DID credit a singer, more often than not, the name given was Bob Storm. When I started collecting song-poem records, I thought I had a fairly good idea who Bob Storm was - the Halmark tracks featuring a pompous, overblown, unctuous baritone, usually singing with a remarkably ridiculous amount of vibrato. That was Bob Storm. Most of the songs, sung by a male singer, that weren't sung by the trebly, somewhat tinny-voiced singer on Halmark. That was Bob Storm. In fact, here's a perfect example of the Bob Storm I came to know and love, on a typically turgid piece called "Wonderful Heaven Waiting for You". This one has the astounding extra benefit of having Mr. Storm offer up a spoken word introduction, which makes it just that much more special! 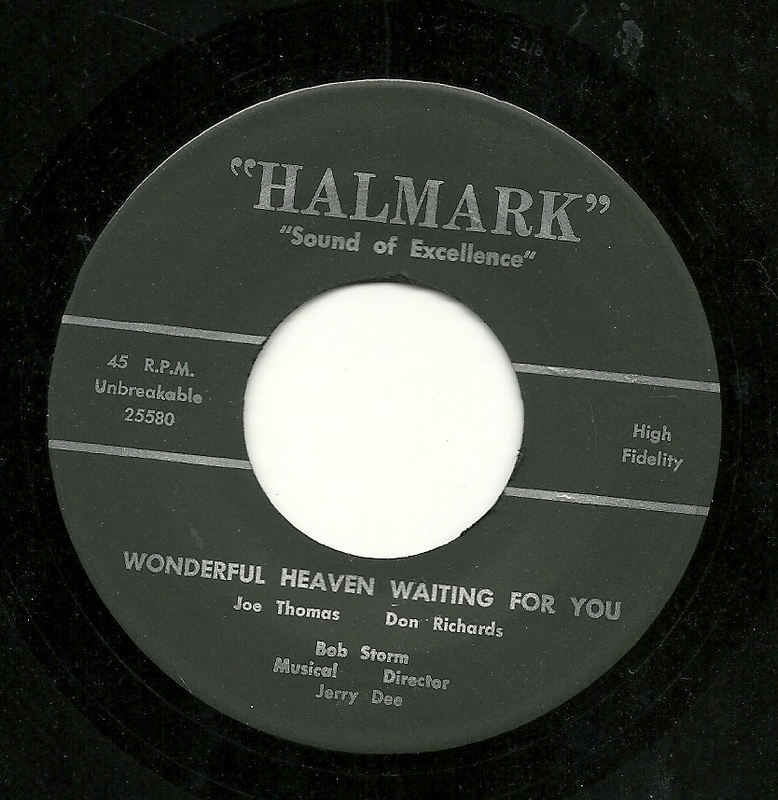 The problem is that, while Bob Storm is the most frequently identified singer on Halmark 45's, the records bearing that name do not always actually feature the singer you just heard on one side of today's disk. I am aware of at least four singers, including one woman, who had releases on Halmark which came out credited to Bob Storm. Most frequently, this happened to the other singer I mentioned up there, Jack Kim. On the other hand, I have one record - my favorite Halmark record of all, "Lady Off Pedestal at Notre Dame", which is credited to Jack Kim, but the singer is clearly the man heard on the track I just shared, the one I always think of as Bob Storm. 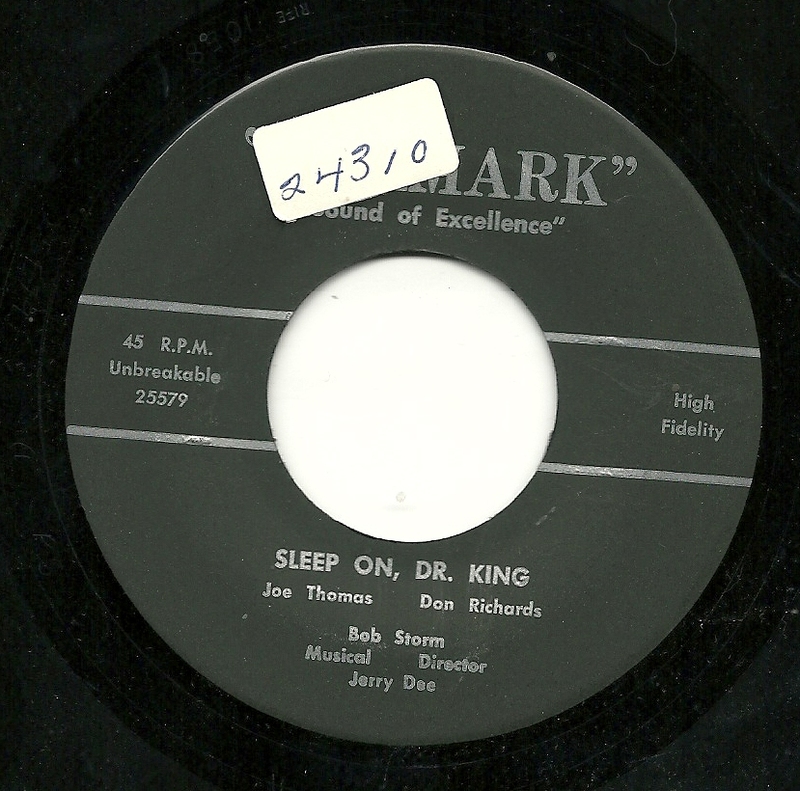 The flip side of this record, a rather pedestrian tribute to Dr. Martin Luther King, titled "Sleep On, Dr. King", is also credited to Bob Storm. And while this isn't Jack Kim (or the female singer I mentioned), I just don't think this is the usual Bob Storm, either (unless he was capable of MUCH more vocal manipulation than most singers. The range, the style and the overall performance quality are not really in the same ballpark. I'm not sure I even recognize this vocalist from other Halmark records! So who is/was Bob Storm? Was there actually a singer by that name (as there was for Jack Kim - real name Jack Kimmel)? Or was that just a catchall artist credit that Halmark used on those releasees where they named a singer, with no actual person by that name or even assumed name. Will we ever know? Here's a record I was quite pleased to be able to pick up, a few months ago. I've known this side of the record for years - it was shared with me on a best-of-his-collection CD by an internet friend of mine... oh, I'd guess it was nearly a decade ago. 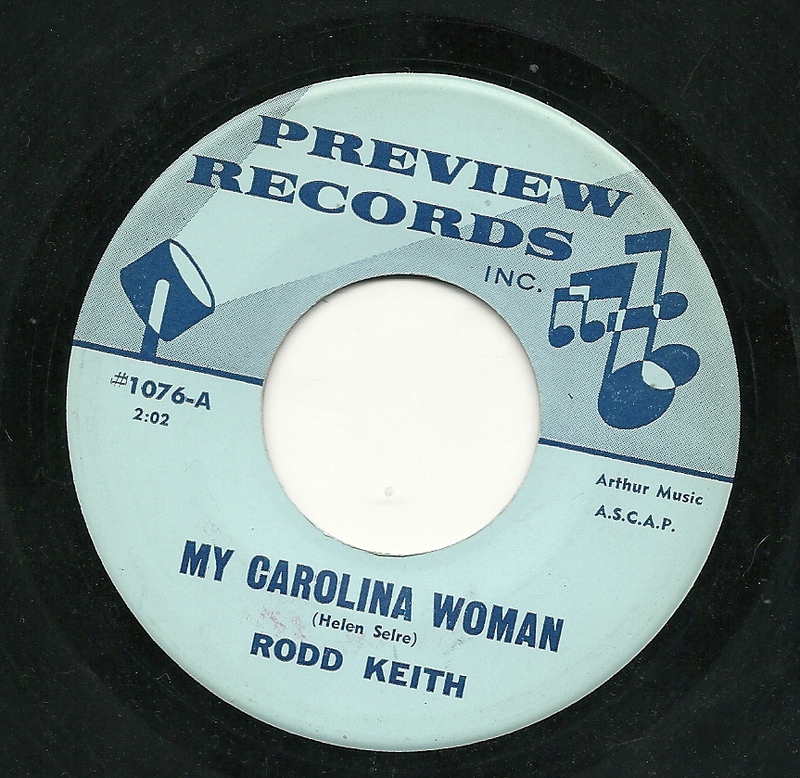 The song - "My Carolina Woman" - is a good one. It's strong, without crossing over into the rarified air of something really special, as a tune, but what really grabs me about it are the places where Rodd Keith goes into triple harmony with himself. More than a few of my favorite Rodd discs contain this feature, although he didn't do it all that often. The section from 1:10 to 1:20, and a similar moment about a minute later, have often rung throuigh my brain, in the decade since I first heard it, and the whole soulful production makes for a nice little record. The flip side is titled "The Singing Hills", and I was initially underwhelmed by it. That didn't last, however - I listened a bit more deeply, and was quite taken with the borderline gorgeous backing track. For half of the track, it seems to be made up entirely of stringed instruments - bass and guitars. If there is a drummer there, he's playing very subdued brushes. About half way through, the piano makes itself known, again, buried in the mix, gradually playing more of a role, while remaining well in the background. It's just a lovely track, and it matches the sweet, lovely lyrics (written by the same song-poet as the a-side, by the way) extremely well. 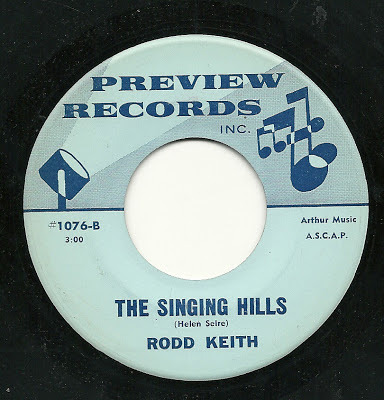 One of the most laid-back tracks I've heard from Rodd Keith, and a real winner. Here's some sweet relief for all of you who have been patiently waiting for a bit of song-poem sharing featuring the fantastic sounds of Eddie Eltman! There may not actually be anyone out there who has actually been waiting for this, because Mr. Eltman is only documented (on the AS/PMA site) to have appeared on one song-poem record, and this is that record, all 206 seconds of it (that's the total of BOTH sides, not of one song!). And a sweet little record it is, too. 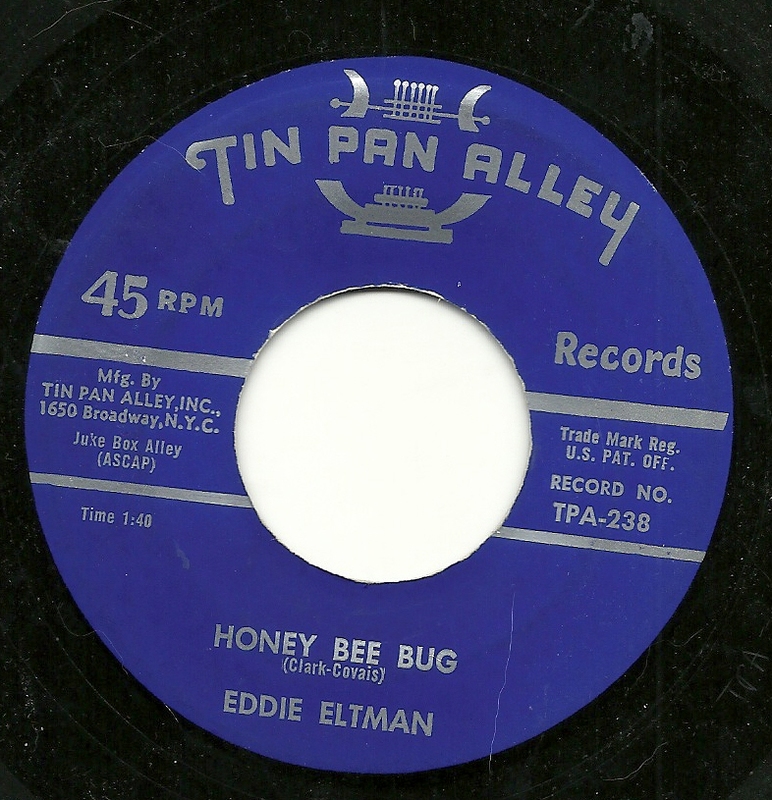 "Honey Bee Bug" came out some time in 1959, and it sounds much like any number of hits and near hits from 1958-59, with the exception of some hamfistedness on the part of the band, particularly the bass player. With a little sanding on the edges of this one, and a better producer, I imagine this could actually have made the charts in that era. 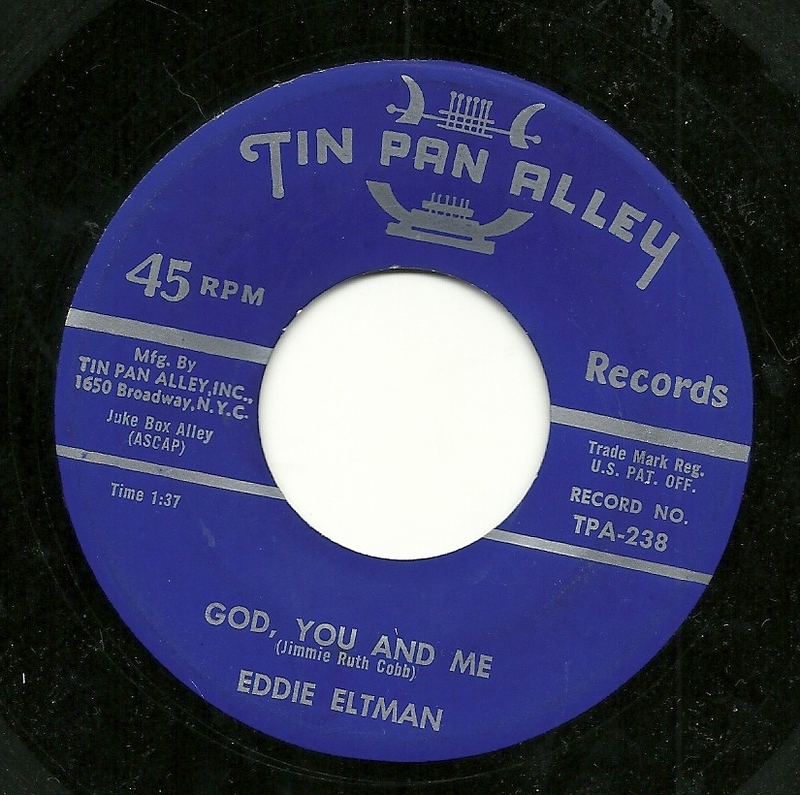 The first thing you may notice about the flip side, "God, You and Me", is that it sounds a whole lot like "Honey Bee Bug". This track has the same strengths and weaknesses as its flip, and while I'm partial to that flip, I could see this one being just as enjoyable to others, and again, this sound could easily have been molded into something chartworthy, during the time it was recorded. I wonder sometimes about these singers who show up just once or twice on a song-poem label - what's the story there. Sometimes they are vanity recordings, made by the writer of the songs, but that's clearly not the case here, and in other ways, this record doesn't differ much from the TPA style of the day, which was to recreate what was selling (and much more effectively than some other labels did). Anyone with insight into this is most welcome to chime in!